Android forex brokers are forex brokers that allow trading on hand-held devices that operate on the Android Operating System (Android OS). The Android Operating System was developed by Google Inc, and allows manufacturers of various hardware and hand-held devices to use this open source operating system to run various software. Innovations by these Android FX brokers as they are known, has allowed the development of forex trading platforms that run on the Android OS to enable traders trade forex on smartphones and tablet devices. Android FX brokers usually provide a link to the Google Play store for traders to download the trading apps directly to their phones. Once the apps are up and running, they can then be used to trade forex using the Android tablets or mobile devices. Here is a list of Android FX brokers. FxPro is one of the best Android FX brokers we have in the market. FxPro provides two versions of its Android trading applications. There is the Android version of the MT4 known as the Android trader, as well as the cTrader (ECN) mobile platform which can be accessed from a URL created for this purpose (https://ct.fxpro.com). The Android Trader can be downloaded from the Google Play store, or the QR code can be scanned with a bar code reader to initiate the download onto the phone. Alpari UK provides a host of mobile trading platforms, and the Android trading applications come in two versions: one for the MT4 and the other for the MT5 platform. Both platforms can be downloaded from the Google Play store, and the availability of these platforms on all Android trading devices make Alpari UK one of the Android FX brokers we have in the market. 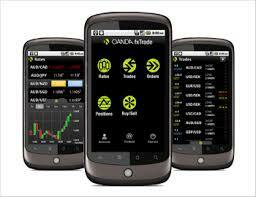 This Android FX broker gives traders choices in the use of mobile apps for trading on Android devices. There is the AvaFX Trader, which is Ava Financial Ltd’s flagship platform, and the MT4 platform. These two Android trading apps can be downloaded from the Google Play store either directly or using the links on the mobile trading page on Ava Financial Ltd’s website. Dukascopy is a Swiss-based Android FX broker that offers the “Swiss Forex” android trading application. The application provides foreign exchange market information in real-time. The list of FX tools that traders can get with the Swiss Forex app include live currency quotes, interactive charts, the forex news calendar and video reviews provided by the Dukascopy TV studio. The application is available for free on Google Play. – Works on a wide range of smartphones and tablet PCs configured with the Android OS. – Real-time interactive currency charts, market price overview and trade history. This platform can be accessed from the Google Play store or from the link on the HotForex website. FXDD is another Android FX broker that gives traders the ability to use their Android trading platform, the FXDD MT4 droidTrader. The droidTrader from FXDD can be downloaded from the Google Play store, and can work on a wide range of smartphones and tablet PCs. Most of the trading apps offered by these Android FX brokers are mobile versions of either the MT4 or their own proprietary platforms (where these exist). So a knowledge of how to use the MT4 platform will greatly enhance the trader’s ability to make the switch to the mobile versions for the Android devices.